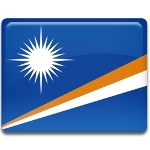 Gospel Day is a public holiday in the Republic of the Marshall Islands celebrated on the first Friday in December. It commemorates the first missionaries who brought Christianity to the isolated archipelago. The first American missionaries to the Marshall Islands landed at Jailut Atoll in 1857. They were Congregationalists, that is why the United Church of Christ (formally Congregational) is now the largest religious group in the country, accounting for approximately 55% of population. It is a Protestant denomination. Other major religious groups include the Assemblies of God, the Roman Catholic church, the Church of Jesus Christ of Latter-day Saints, Bukot Nan Jesus, the Baptist church, the Seventh-day Adventist church, Full Gospel, the Jehovah's Witnesses. Not all Marshallese are Christian; there are also members of the Baha'i Faith, Jews, and Ahmadiyya Muslims. Very few citizens have no religious affiliation. Marshall Islands Gospel Day is somewhat similar to Thanksgiving Day in North America, family and celebratory meals being the main focus of the celebrations. However, the Marshallese people also attend special church services to honor the first missionaries.